Choose the New Company command. 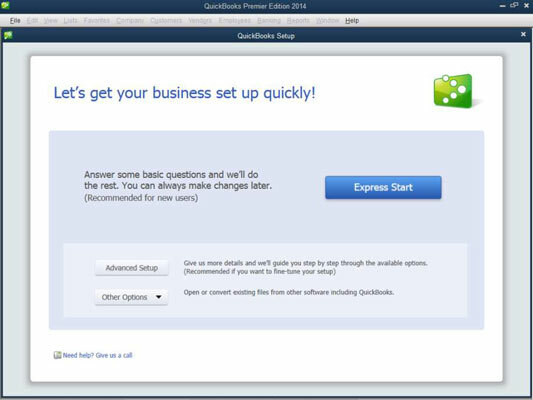 The Let’s Get Your Business Set Up Quickly screen of the QuickBooks Setup appears. When you’re ready to begin, click either the Express Start button or the Advanced Setup button. QuickBooks 2014 provides an accelerated version of the QuickBooks setup process, which you can use when you don’t want to customize setup. If you click the Express Start button, QuickBooks collects a bit of information about your company and, based on that information, sets up a company file that should work for a business like yours. The Advanced Setup button, if clicked, starts the EasyStep Interview, which walks you through a bunch of screens full of information that let you rather tightly specify how the company file that QuickBooks sets up should look. Click the Advanced Setup button. After collecting this general company information, QuickBooks creates the company data file that stores your firm’s financial information. 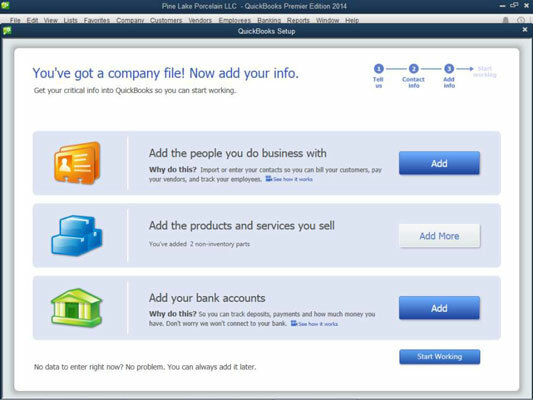 QuickBooks suggests a default name or a QuickBooks data file based on the company name. All you need to do is accept the suggested name and the suggested folder location (unless you want to save the data file in the My Documents folder, which isn’t a bad idea). 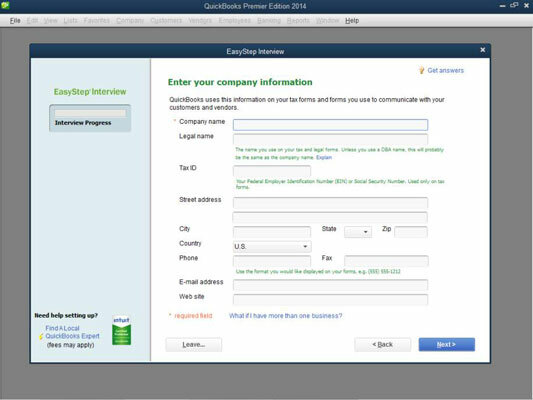 After QuickBooks collects the general company information, the EasyStep Interview asks you some very specific questions about how you run your business so it can set the QuickBooks preferences. Preferences in effect turn on or off various accounting features within QuickBooks, thereby controlling how QuickBooks works and looks. Perhaps the key decision that you make in setting up any accounting system is the day on which you begin using your new system. This day is called the conversion date. Typically, you want to begin using an accounting system on either the first day of the year or the first day of a new month. Accordingly, one other big question you’re asked is about the conversion date. The easiest time to start using a new accounting system is the beginning of the year. The reason? You get to enter a simpler trial balance. At the start of the year, for example, you enter only asset, liability, and owner’s equity account balances. At any other time, you also enter year-to-date income and year-to-date expense account balances. Typically, you have this year-to-date income and expense information available only at the start of the month. For this reason, the only other feasible start date that you can pick is the start of a month. Review the suggested chart of accounts. At the very end of the EasyStep Interview, based on the information that you supply about your type of industry and the tax return form that you file with the IRS, QuickBooks suggests a starting set of accounts, which accountants call a chart of accounts. These accounts are the categories that you use to track your income, expenses, assets, and owner’s equity. The accounts that QuickBooks marks with a check, as the screen explains, are the recommended accounts. If you don’t do anything else, these checked accounts are the ones you’ll use (at least to start) within QuickBooks. However, you can remove a suggested account by clicking the check mark. QuickBooks removes the check mark, and that means the account won’t be part of the final chart of accounts. You can also click an account to add a check mark and have the account included in the starting chart of accounts. When the suggested chart of accounts looks okay to you, click Next. It’s fine to just accept what QuickBooks suggests because you can change the chart of accounts later. Add your information to the company file. 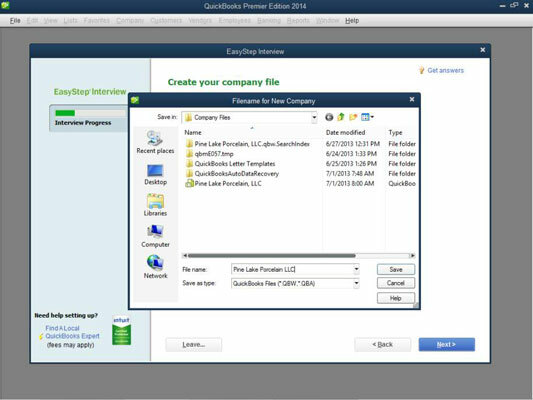 No matter whether you use the Express Start method of creating a company file or the Advanced Setup/EasyStep Interview method, after you and QuickBooks set up the company file, QuickBooks prompts you to enter your own information in the company file. To describe customers, vendors, and employees, click the first Add button. QuickBooks asks whether it’s possible to get this data from someplace else, such as an e-mail program or e-mail service (Outlook, Gmail, and so forth), or if you just want to enter the information into a worksheet manually. You’re probably going to enter the information manually, so click the appropriate button and then click Continue. 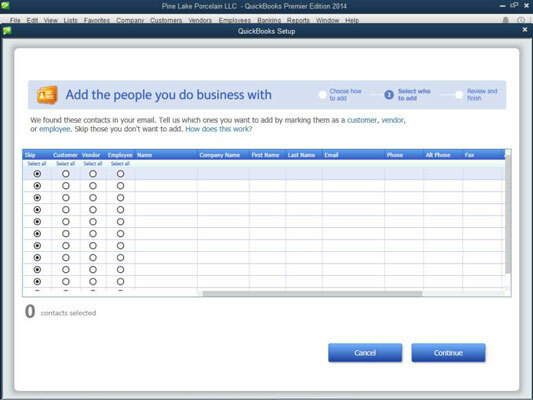 When QuickBooks displays a worksheet window, enter each customer, vendor, or employee in its own row, and be sure to include both the name and address information. Click Continue when you finish. 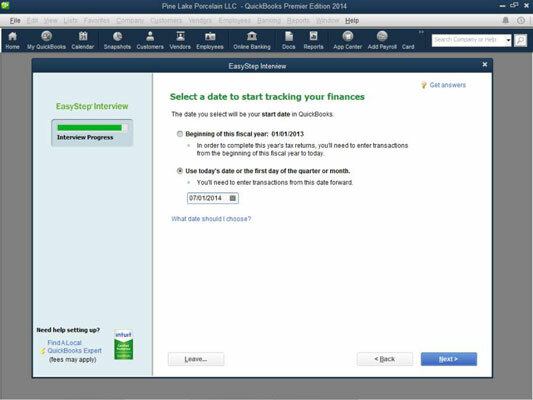 QuickBooks then asks whether you want to enter opening balances (amounts you owe or are owed) for customers and vendors. Indicate that you do by clicking the Enter Opening Balances link and then enter the opening balances in the screen that QuickBooks provides. To describe the stuff you sell, click the second Add button. To describe your business bank account (or bank accounts), click the third Add button.